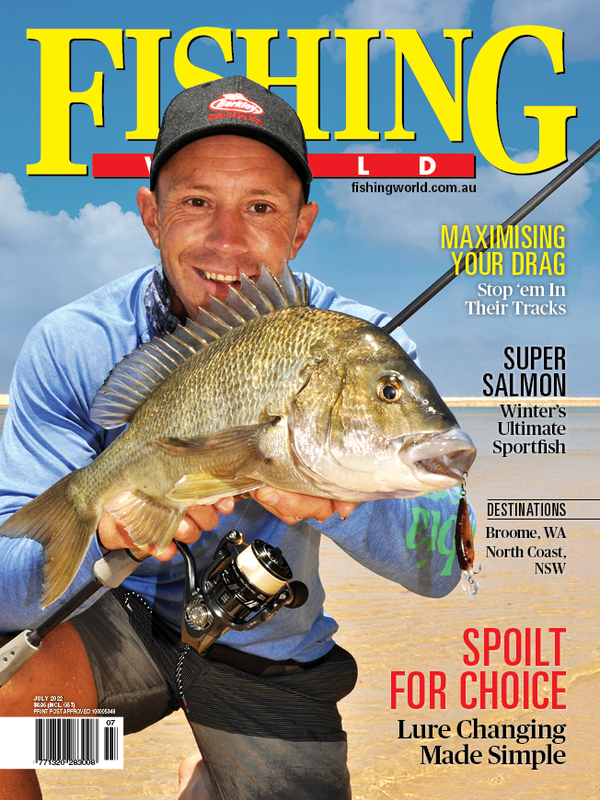 Shortly afterwards I received a 2019 Stella 14000XG test reel to take on a short trip across the ditch in pursuit of kingfish on topwater lures from the rocks – a harsh proving ground for new tackle! Upon first glance of the newly released Stella, it didn’t appear to look too dissimilar to the 2013 Stella SW. However, upon closer inspection the differences in design become quite apparent. When comparing the 2013 and 2019 Stella 14000XG, the body and rotor of the new Stella are slimmer and more compact and the bail wire is slightly thinner. Most noticeably, the rotor body has two water draining ports that would help drain water that accumulates under the spool. The 2019 Stella SW also makes use of a new heat dissipating ‘Heatsink’ drag system. This new drag panel is said to keep the drag cool during powerful runs under heavy drag pressure. While using this reel, the drag was consistently pushed to over 10 kg of pressure (which is well below its rated 25 kg drag maximum) and remained extremely smooth during the explosive surges of 20 kg+ kingfish diving for the bottom. The 2019 Stella is also said to have cut down handle rotation torque by about 30%. Basically, this means the reel handle requires less force to turn the gears and rotor. This became increasingly noticeable while fishing it alongside the 2013 model when working stickbaits and poppers and also whilst fighting fish – it is less fatiguing to use over the course of a fishing trip. The 2019 Stella also boasts an impressive IPX8 waterproof rating. The reel I tested was exposed to heavy spray and wash while using it intensively over a week and from what I can tell , it hasn’t suffered any water intrusion. First impressions: After approximately 2,500 casts and about 50 hours of use, the 2019 Stella has performed faultlessly. The newly released range appears to be a more refined, compact and lightweight package that doesn’t compromise on strength and power! Click HERE for more information and full specs.